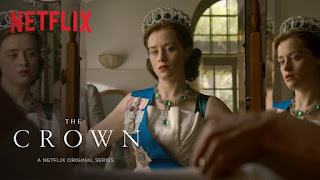 Sharon and I finished watching the second season of The Crown on Netflix. We finished the first season in April. The show is a biographical story about the reign of Queen Elizabeth II of the United Kingdom. The second season covers the period from the Suez Crisis in 1956 through the retirement of the Queen's third Prime Minister, Harold Macmillan, in 1963 to the birth of Prince Edward in 1964. Sharon and I enjoyed the series. I recommend it. Unfortunately, season three is scheduled to be released in 2019! As I said after season one, I continue to wonder about the real nature of the relationship between Elizabeth and Philip. Philip's back story is get spotlighted a couple of times in season two and is fairly incredible. [Note to self], I am going to read Prince Philip: The Turbulent Early Life of the Man Who Married Queen Elizabeth II this year.